Happy Valentine’s Day everyone! Whether you think this is just a lame commercial holiday or not, it’s still a good day to spread love to the people you care about. Aaaand in some cases that love comes in the form of cruddy Valentine’s Day memes. But anyway, since the PTFP cares about all of their viewers, I am writing this guest post today to bring you all hilariously cringey Poptropica cards! I do say guest post because while I do still help out with the blog at times, I don’t consider myself a full time author. Click on the images to see them in their full glory! Yes, yes, I know those were all very cheesy and obscure, but then again so is this entire holiday. Still, send them to your fellow Poptropicans if you want to spread the love! Plus, keep a lookout for other people in the community getting into this celebration in a ton of different ways! Shaky Skunk has made some Valentine’s Day cards in the past, DeviantArtists like BlazingAngel123, Slippery Raptor, and SmileyFaceOrg have made some as well, and there of course has been a ton of shipping going on lately. 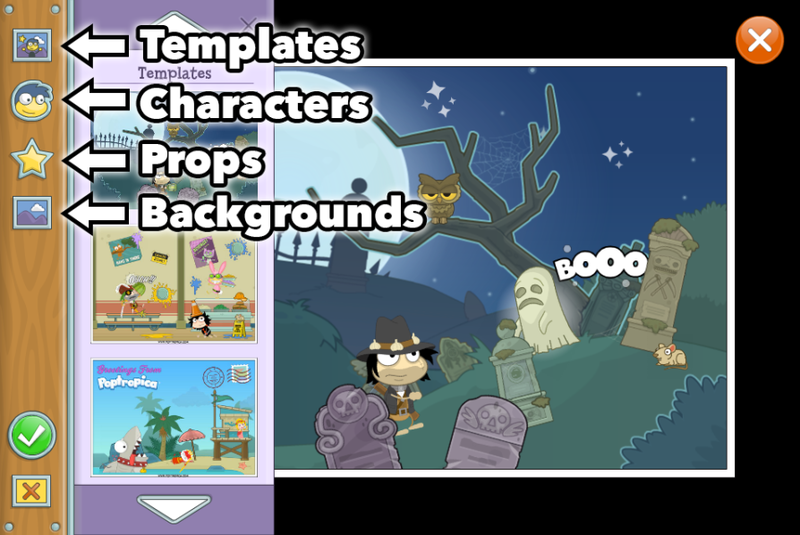 Not to mention the lovey-dovey Poptropica store items you can buy and the sweet photos you can make in the photo booth. Hey everyone, SD here. First things first: Escape from Pelican Rock Island is going to be out for everyone on December 30th! On a completely different note, the week 5 Island Hopper winners have been announced! Congrats to all the winners! For the rest of you, remember that time is running out for the sweepstakes, so get hopping! Oh, but that’s not all Poptropicans! There has also been an awesome app update! We have already talked about Pelican Rock, but there are also cool new winter costumesavailable! Some free, some for $0.99. Black Friday Deals and More: Hop to it! LOTS of Poptropica stuff to cover today! First up, the Island Hopper Sweepstakes. 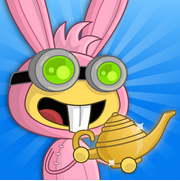 From today until December 31, we’ve hidden one Island Hopper Ticket in every common room on Poptropica. Each ticket that you collect counts as one entry into the sweepstakes. There are over 40 tickets to find, which means you have over 40 chances to win! Click here to go to the rules page for this event. Sadly, you have to live in the US to enter. 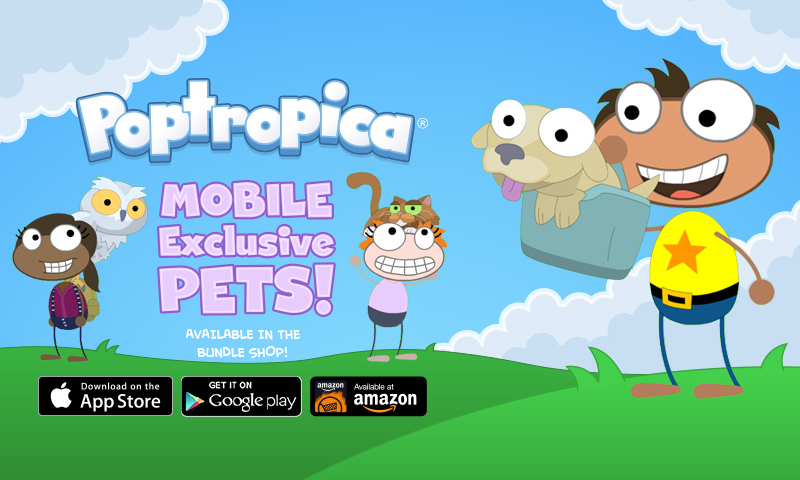 20 runner-ups will receive a Poptropica Blimp Toy, as well as a 1-month Poptropica Membership. 10 2nd-place winners will receive a 6-month Membership. Finally, the grand-prize winner will get to meet Jeff Kinney in a 30 minute long video call, receive a Poptropica Blimp Toy, AND get a 6-month Membership. In addition to this, there is also a weekly sweepstakes, where 5 winners will be chosen every week to receive a 1-month Membership. Remember to read the Official Rules for more details because it ends on December 31! All winners are chosen at random. In other news, you can now visit Escape from Pelican Rock Island for a little sneak peek! 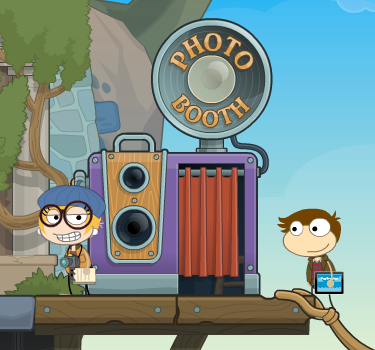 On the island, you can talk to a few Poptropicans to earn prizes AND you can visit the Prison Break themed Photo Booth! 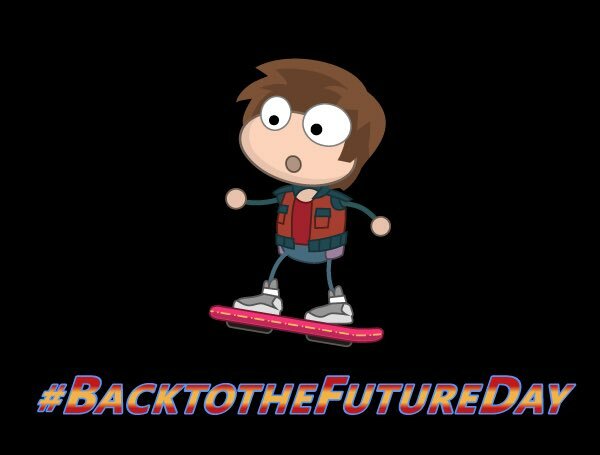 Also, get ready for Black Friday on Poptropica! Discounts in the Store among other things I assume. Of course, keep a look out for other Poptropica updates and sneak peeks! Hey guys, SD here! 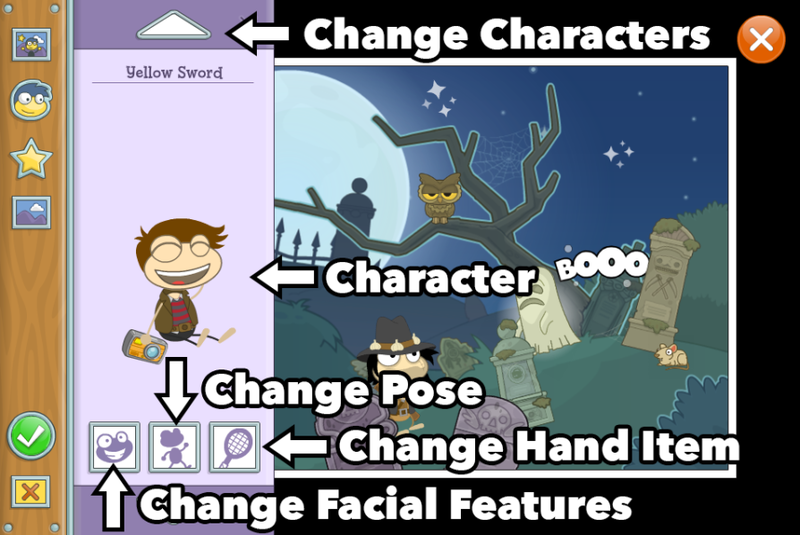 Remember how some spooky new features were added to the Poptropica Photo Booth? Well it looks like there’s more to it! 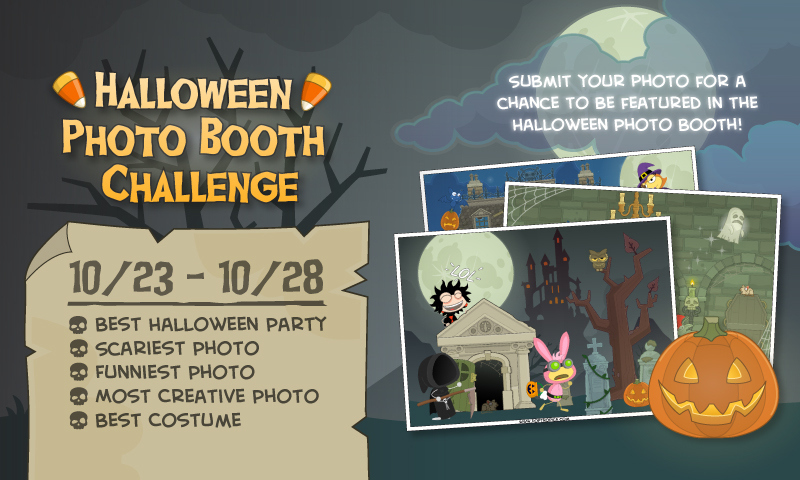 Yes, Poptropica is having a Halloween Photo Booth Challenge and anyone can enter! Just create any spooky picture in the photo booth. As you can see in the image above, there are 5 categories that you have a chance of winning. There will be one winner and five runner-ups for each category. All of the winners/runner-ups will be featured on social media, while the main winners will be temporarily added to the photo booth. That means anyone will get to use the winners’ Poptropicans in their pictures AND their winning photos will be featured as templates. Once you’ve made your perfect picture, just hit the “Submit Your Photo to the Halloween Photo Booth Challenge” button. Remember, the contest lasts from October 23-28, so don’t miss out! Fantastic Photos, Awesome App Updates, and Cool Cartoons! Hey guys, Spotted Dragon here! Lots of updates to cover today. But first… lemme take a selfie. The Creators just added a cool new feature to the game, specifically on Home Island. What is this great new feature you ask? A photo booth! Upon visiting the island, you can find the photo booth next to the Shop. Thanks to Ultimate iPad Expert for the all the pictures! Once inside, you will be greeted by a panel of buttons on the left of your screen. They are all labeled in the picture below. The best part about the photo booth is that you can change the entire scene all on your own, including the characters, props, backgrounds, and more! You can either start from scratch, or edit a pre-made template. And don’t worry… the photo booth is available for everyone! So what are you waiting for? Go to Poptropica now to try it out for yourself. Yeah, this is me showing off my mixtape (which is on fire btw). I don’t know about you guys, but I really liked this update. However it’s still new, so I hope more tools get added. Like adding your friends to the picture, maybe an undo button, a way to add unique text, etc. In other news, the Poptropica app got updated once again! It has every island up to Arabian Nights episode 3 and Hub Island now looks more like the online version. There are also more costume packs available in the Shop! Greek Gods, Heroes of the Ages, and Pets. Note that there are in app purchases and each pack costs 99 cents.